Last year I finished up this Prairie Schooler Prairie Seasons Winter and used burlap to tie the stitching to the wreath .. I just wasn't feeling the burlap anymore so I took a trip to the basement and added a new ribbon for tying.. 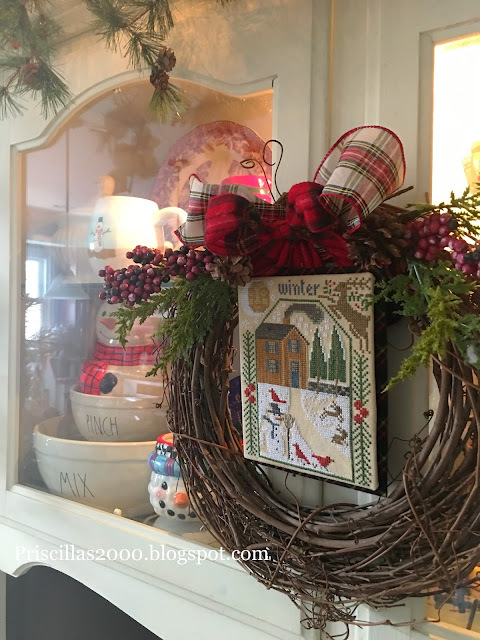 It is a red plaid flannel ribbon and I also added some of the light colored plaid ribbon for contrast.. the greenery and berry picks are just stuck through the wreath so they can be changed out..The old version of the wreath is below.. The hutch is filled with lots of snowmen .. most of them found while thrifting.. I was so lucky this week when I stopped into Homegoods and there were 2 Rae Dunn mixing bowls on the shelf .. I just told my daughter last week I needed to find some :) I still need the middle size , but I will find it! On the back of the hutch is a vintage scale on a thrift store frame and some snowmen..
One of the little snowmen from the cabinet sits on a greenery wreath.. 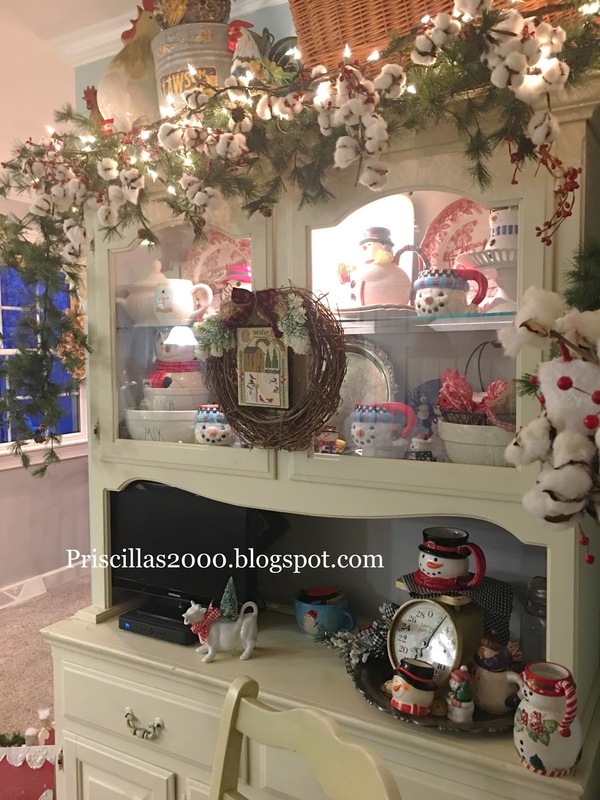 This hutch was oak and really ugly before it got painted with chalk paint and now it is an amazing part of the kitchen ..I tried to get rid of it on Craig's list for $50.00 before I painted it but no one would take it! 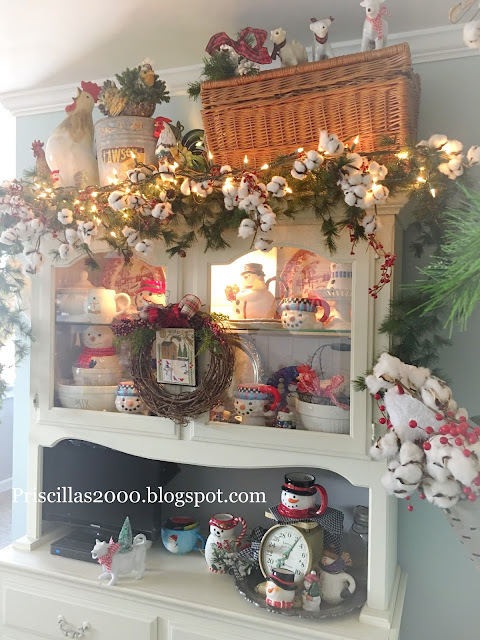 On the top of the hutch is a greenery garland and a cotton stem garland with white lights woven through..A picnic basket from the thrift store and some cow creamers on top of that .. Also a collection of chickens ..one in a vintage galvanized bucket.. 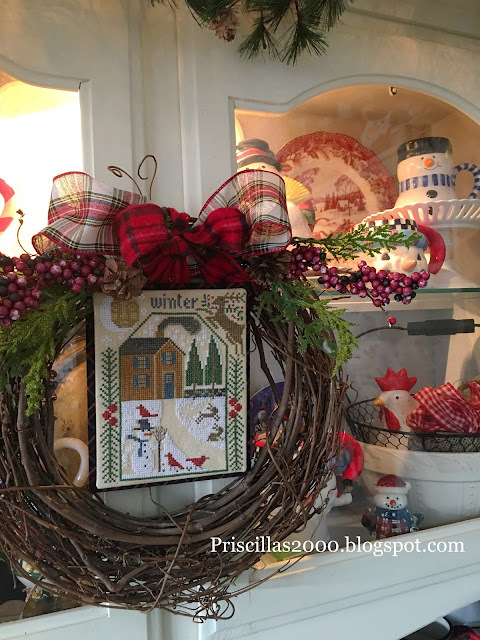 I love the revamped wreath and think it looks wonderful with all the rest of the kitchen goodies! I love how you redid the wreath! I collect snowmen too! What I tried to say is that I check several times a day for posts from you on your decorating. The hutch looks wonderful. Glad you were unable to sell it. The whole post looks cheery and homey. Love it. Now I’m anxiously awaiting #27 for your flosstube! Lol! Thx Priscilla. The ribbons made the wreath more colorful in a cheerful kitchen too! New wreath looks great. 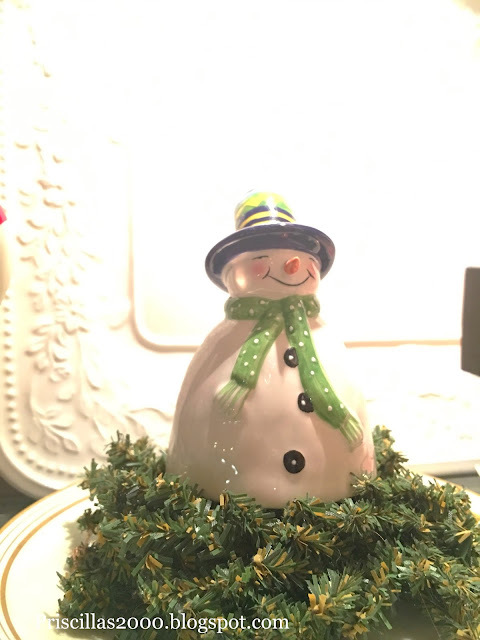 All the snowmen are just delightful!! I love how you have displayed all of those snowmen. 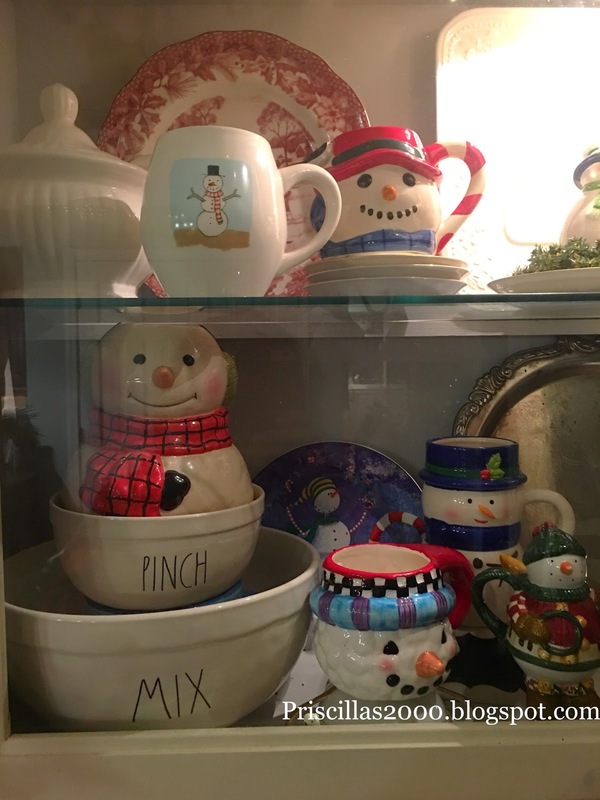 I had kept my snowmen on display, but then I realized that I just needed a clean slate. I just didn't have the energy to make the display look really pretty. I really enjoy seeing your various displays. 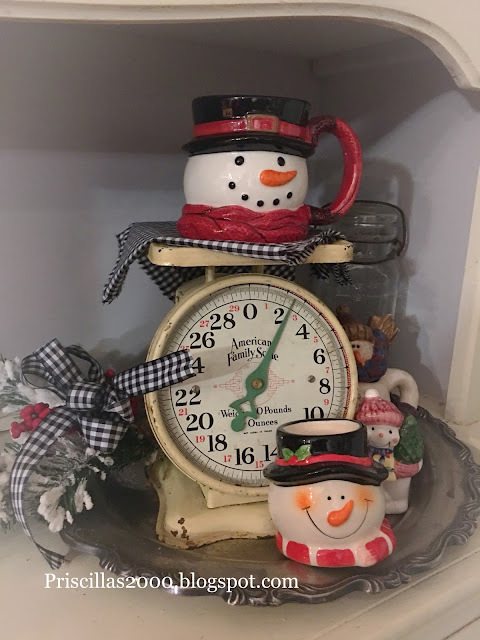 I love how you use your thrift store finds. 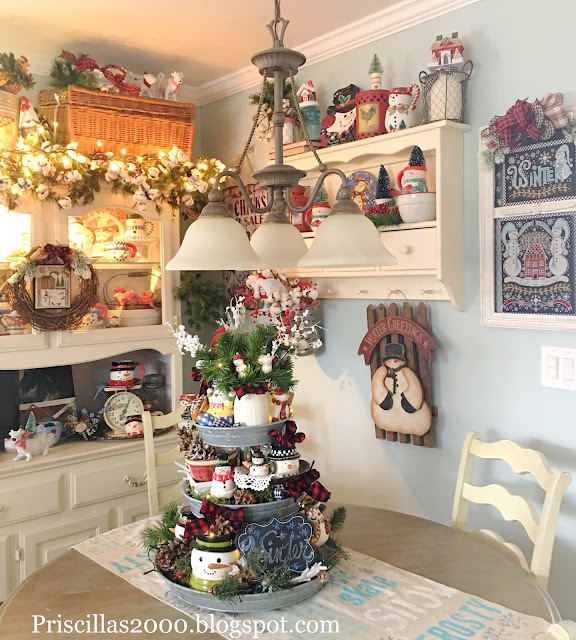 Loving all of it especially the wreath. So cheery and colorful.